Your guide to speaking Balinese quickly and effortlessly in a few hours. 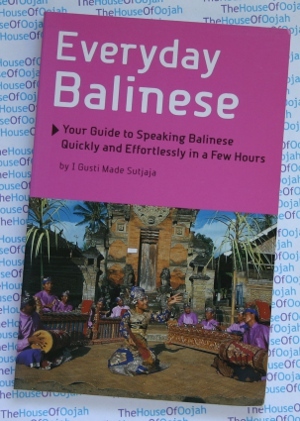 "Everyday Balinese" is targeted at anyone--foreign or local--who wishes to learn to speak colloquial Balinese. There are 23 lessons in the book, each one presenting a variety of topics and situations centering on the daily life of the Balinese. The front of the book contains a pronunciation guide, while the end has a section on greetings, ordinal numbers and a handy dictionary, with Balinese words arranged alphabetically, followed by their Indonesian and English equivalents. 3. basa singgih (S): corresponds to Javanese krama; a somewhat artificial construct containing many Sanskrit and Javanese words. Many Balinese ketah words have no singgih equivalents, and have to be promoted to singgih status when the latter is being used. Originally Javanese. A standard balinese romanization, based on Dutch spelling, was provided by H.J. Schwartz in Batavia in the early twentieth century.